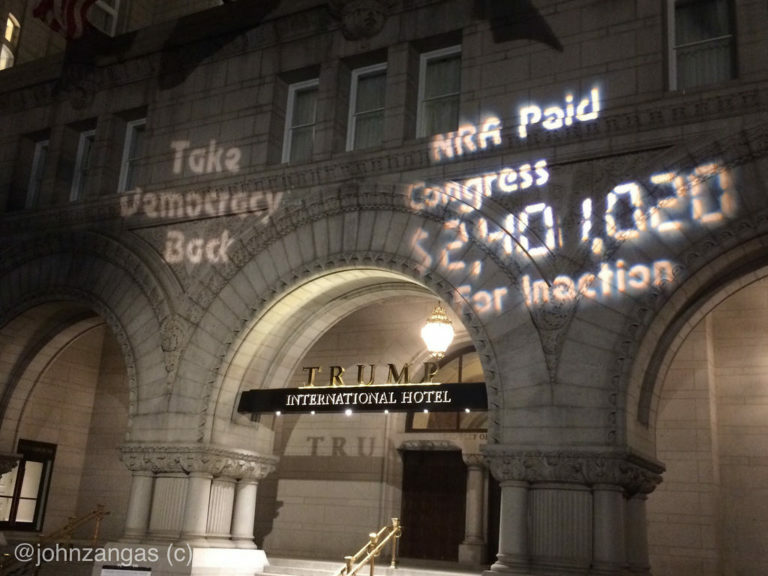 Washington, DC–Activists lit up Trump International Hotel with messages critical of the National Rifle Association lobby on Thursday night. The light show was timed to draw negative attention to the NRA annual conference being held in Dallas, Texas on Friday. Activists projected giant memes across the iconic bell tower of the hotel, reading, “The NRA paid Congress $2,401,020 For Inaction” – “Take Democracy Back” and “NRA Enables Domestic Terrorism.” Other light images included memes of an AR-15 and a skull and crossbones. Trump Hotel security called police and within minutes DC police responded and ordered the activists to turn off the projector or face arrest. Police claimed the activists had no permit or permission to be on “private property” despite the equipment being staged on the sidewalk far from the building. Activists refused to leave and invoked their first amendment right to free expression. They also claimed they were in fact on a public sidewalk and needed no permit. Hotel security stood silently in the background while police and activists discussed whether a permit was required and whether the light projector was staged on private property. A few minutes later, CODEPINK: Women for Peace activists arrived. Medea Benjamin, co-founder of the Woman’s peace group and Tighe Barry, a long-time member of the group, weighed in on the dispute. With extensive knowledge of the federal laws, rules and local statutes governing permits and protests, Berry showed on the sidewalk where the U.S. Government jurisdiction separates the DC jurisdiction. It was clear the activists were neither on private property nor required to obtain a permit for permission to demonstrate. As the drama unfolded, passers-by stopped to take pictures of the light projection and encouraged the activists to stand their ground and not yield to police. Shortly afterwards, police left and there were no arrests. The projection resumed for another 10 minutes until the projector batteries ran low. The demonstration was timed to highlight the NRA conference and the hypocrisy of its being held in a gun-free zone while across the nation, mass shootings continue unabated. It also exposed a growing national resistance to the NRA money machine and its sponsorship of Congressional defenders. The light projection was part of a historic nationwide effort to highlight the negative impacts of the NRA lobby. Backbone Campaign coordinated light projections in 15 other cities, including Dallas, Boulder, Los Angeles, San Diego, Tallahassee, Nashville, Spokane, Madison, NYC, Chicago, Portland, Atlanta, Detroit, Tacoma, and Seattle. The anti-NRA movement has urged passage of “commonsense” gun regulations and a ban on semi-automatic weapons. Students and teachers who have seen first hand the carnage of mass shootings in their schools have rekindled efforts to pass gun legislation such as background checks and semi-automatic weapons ban. Students from Marjorie Douglas Stoneman High School led a mass protest of the NRA in Washington, DC on March 24, drawing over half a million to the rally. They called for an end to sales of AR-15 semi-automatic weapons and urged voters to reject those elected leaders who take money from the gun lobby. Congressmen have been given over $2.4 million in contributions since 2015, according to Backbone Campaign activists. The rally turned out to be one of the largest protests against the NRA lobby and its Congressional supporters. The Trump International Hotel has been a lightning rod for protests since the GAO leased the property to Trump International Hotel, LLC. John Zangas and fellow activists, GOOD ON YOU! as they say down under. Good on you. Our only hope for survival of this Democracy is to get the money out of Congress. Proud of you truthsayers, who are scarce on the ground, nowadays.